Resources :: Videos: A Student's Guide to Read Naturally Live :: Read Naturally, Inc. Teach your students how to do the steps of any Read Naturally Live series by combining this four-part video series, A Student's Guide to Read Naturally Live, with hands-on experience. In each video a student demonstrates a different set of Read Naturally Live steps. After watching a video, have each student log in to his/her first Read Naturally Live story and complete the steps demonstrated in the video. You must enroll, license, and place your students before showing these videos to them. The following document provides instructions for setting up students and using the videos to teach them the steps. Implementing "A Student's Guide to Read Naturally Live"
The students watch this video, and then each student completes the demonstrated activities in his/her initial Read Naturally Live story. When all students are playing Wordtastic, show Video Part 2. After the students watch this video, each student continues to play Wordtastic until the teacher logs in to conduct the student's cold timing. Then the student works on the Read Along step. When all students have completed at least one read along, show Video Part 3. 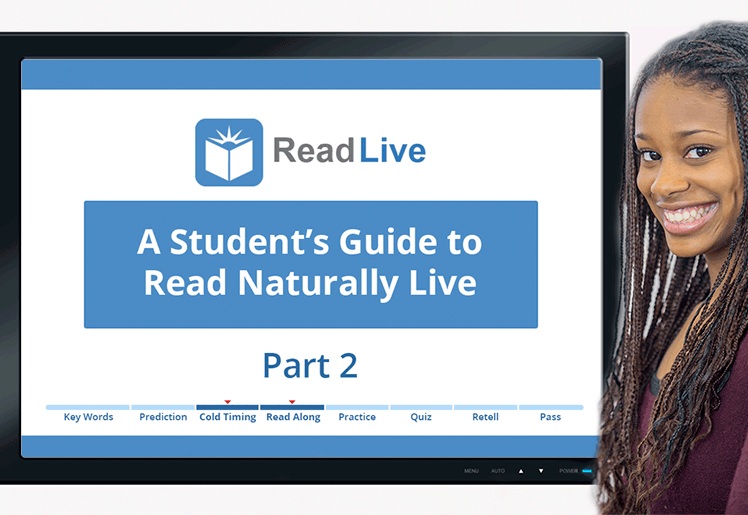 After viewing this part of the video guide, each student completes the demonstrated activities in his/her Read Naturally Live story. When all the students reach Pass/More Practice or Pass/Wordtastic, show Video Part 4. After watching this video, each student plays Wordtastic until the teacher logs in to work through the Pass step with the student. After meeting all the requirements, the student selects a new story.